An NBA legend on the court, Kareem Abdul-Jabbar is also a “Renaissance Man” for our time. His most widely admired accomplishments are his six NBA championships and his still unmatched record as the all-time leading NBA scorer. However, since retiring in 1989, Abdul-Jabbar has moved off the court to become a cultural icon in many fields. He has acted in movies and television shows. As a television commentator and as a columnist for The Washington Post and Time Magazine, he has spoken out about issues of race and religion in America as well as just compensation for college athletes. His books telling of his basketball career and his relationship with legendary UCLA Coach John Wooden have been best-sellers. His fictional writing includes the Mycroft Holmes mystery in novel and comic book form. 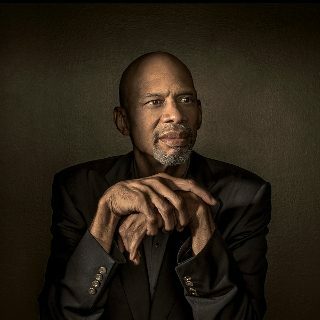 He also writes young adult novels; his most recent is the inspirational Becoming Kareem: Growing Up On and Off the Court. Kareem Abdul Jabbar, joins us in conversation to share stories of leadership in his career and his life. Kareem Abdul Jabbar will be interviewed by Paul Loeffler. Paul Loeffler, is the longtime radio voice of Fresno State football, basketball, and baseball on 940 ESPN. His work can also be found on national TV & radio broadcasts for ESPN, as well as his radio program, Hometown Heroes, in which he interviews World War II veterans. In 2013, he helped launch Central Valley Honor Flight, which takes veterans to see their memorials in Washington, D.C. Paul and his wife, Tonia, live in Fresno with their two daughters.